‘Tis the season for kindness and generosity, and Radio Lollipop Australia was the lucky recipient of both, thanks to our neighbours in Brisbane. Somerville House is a school just across the road from Queensland Children’s Hospital and they have made it their mission to help make life a little bit better for young patients. 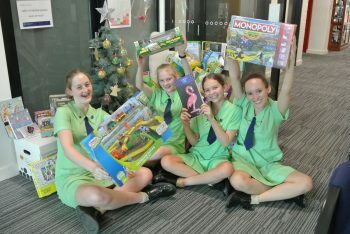 Hundreds of students have amassed a treasure trove of toys, games and crafts to help our volunteers brighten the day of children in hospital in the year ahead. Every year level was given a different age group to buy for to ensure a broad range of gifts and prizes are available to cater to all tastes. Under the guidance of Community Program Co-ordinator Tanja Rees, the students have selected some innovative products guaranteed to help pass long hours spent in a hospital bed. The stash of surprises will no doubt enhance the wonderful work done by our volunteers as they continue to spread the Radio Lollipop joy in 2019.